Nissan’s Titan XD remains in many ways the Goldilocks of hard-working pickups. Designed to have more capability than a half-ton truck but without the overkill, cost and drawbacks of a heavy-duty, three-quarter-ton pickup, the XD is uniquely slotted in the marketplace. It’s designed to be “just right” for a certain type of truck buyer, a person who tows or hauls more than more than what a light-duty model can handle but doesn’t want the stiff ride, thirsty consumption and stratospheric sticker prices of domestic-brand heavy-duty pickups. After spending a week driving the Titan XD, I think it fits that mission perfectly. It’s noticeably harsher over the road than any contemporary half-ton truck — especially when fitted with the Pro-4X off-road suspension and tires on my tester — but also vastly more capable. Properly equipped, the Titan XD can tow 12,310 pounds or carry a payload of 2,080 pounds. While the federal government doesn’t issue fuel-economy ratings for heavy-duty trucks, my real-world experience at the fuel pump made it cheaper to drive than I expected. 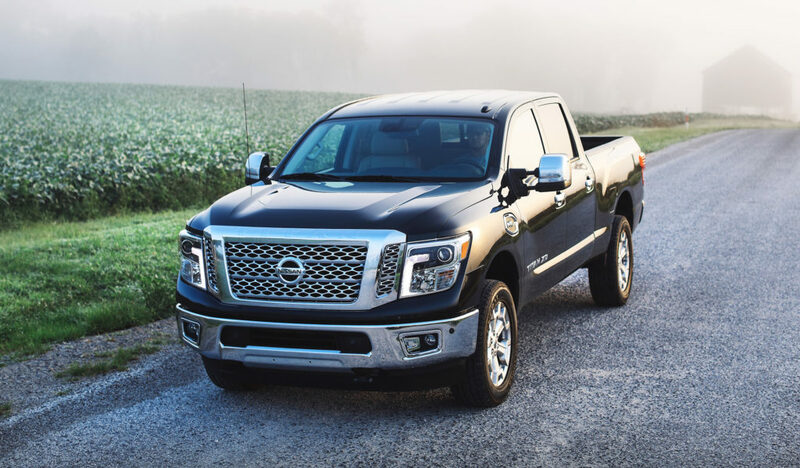 The Nissan Titan XD is designed to offer more capability than a light-duty pickup truck. It has a beefed-up frame, brakes and suspension engineered to haul heavier loads. Two powertrains are available in the Titan XD. One, a 5.6-liter gasoline V8, routes 390 horsepower and 394 pound-feet of torque through a seven-speed automatic transmission. The other is a 5.0-liter Cummins diesel fitted to a six-speed Aisin automatic. It makes 310 horsepower and, more importantly, 555 pound-feet of torque that helps dramatically when pulling heavy trailers from a dead stop. While the Titan XD looks fairly similar to the half-ton Titan, much of the guts underneath the body have been beefed up to handle heavier loads, and you can feel it from behind the wheel. A heavier frame, gigantic brakes, stout suspension and tough axle and differential give it a heftier, more purposeful driving feel than the light-duty Titan. Cabin materials and construction no longer stand out compared to the recently redesigned domestic competitors, but the overall design and functionality of this truck remain top-notch. I especially like its innovative Utili-track tie-down system with rails and movable cleats in the bed. The lockable, weatherproof Titan Box is another cool, well-designed option. Accessible from inside the bed, it keeps things hidden from street level, can be used as a cooler for tailgating, and is removable for those times when you need the full width of the bed for hauling cargo. 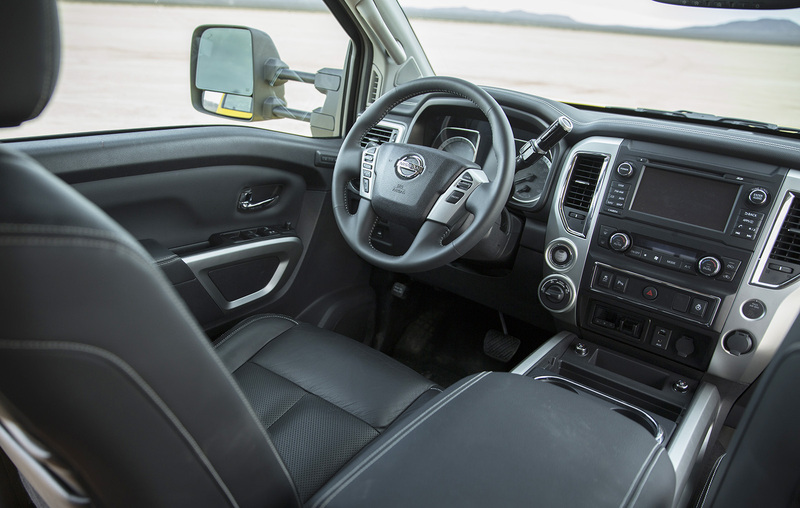 The Titan XD’s cabin is spacious and intelligently designed. Smart storage features both in the cabin and in the bed make it useful and durable. Changes to the Titan XD for 2018 are minimal. A new Midnight Edition package offers a custom look with black mirrors, darkened headlamps, dark badges, 20-inch black wheels and body-color bumpers. It has the sinister, blacked-out look that’s increasingly popular on everything from sports cars to SUVs. For 2019, the Titan is available with a spectacular Fender audio system that I got to experience at the Texas Truck Rodeo in October. It delivers crisp highs and punchy bass that would sound impressive in a luxury car and are downright surprising in a hard-working pickup like this. Pricing starts at $32,040 for the base, single-cab S grade with the gasoline engine. The popular Crew Cab starts at $37,240 with the gas V8 or $42,490 with the diesel. If you’re looking for a luxury experience, the sticker price tops out at $63,610 for the Platinum crew cab with the Cummins engine — a downright steal compared to the dizzying heights some upper-echelon truck prices are reaching these days. The Titan XD offers serious capability, a smart utilitarian design and excellent powertrain and platform for towing, all without the expense and drawbacks of a full-blown, heavy-duty truck.